Besides factory stuffing, we also offer dock-stuffing services for both types of goods - hazardous and non-hazardous. The boxes are stuffed with paper or other materials to prevent the consignment from any possible damage during the transit. With years of experience, we offer end to end services at the most competitive rates. Obtaining permission from custom for stuffing from factory. Our skilled labourers and machine operators have the expertise to carefully de-stuff the cargo and place it in such a manner that perfect utilization of space is done and on the other hand the safety of the cargo is not sacrificed. We undertake Import and Exports clearance of our clientele including Multinationals, Private and Public Ltd. companies. We offer most economical freight rates encompassing all types of cargo- both by air and sea. 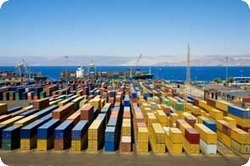 - We also have expertise in the area of Dock Stuffing where the cargos are stuffed in containers in the docks area. This is carried out under the supervision of our custom authorities. Apart from this we engage in arranging labours, pallets, forklifts etc, in time in order to connect the scheduled vessel. Our ICD is well equipped with all the latest equipments required to handle the containers and cargo. There is the latest Reach Stacker which provides fast and safe handling of containers .The Warehouse is equipped with Forklift and Hydra for fast and safe stuffing and handling of cargoes. The special care is undertaken for Fragile goods to prevent the consignment from any possible damage during the transit. Providing service like stuffing service. We offer the clients with high standard custom warehousing services that ensure the complete security of cargo in a professional way. Our full fledged private warehouses are well equipped with all the latest facilities to protect the stored cargo from any harmful factors including fire, theft, moisture, rain, pest etc.